This beer has become something of a Christmas tradition for me, but then I guess that’s the idea of it. Released in a box every November, the Fullers Vintage series has been going since 1997 and are produced using what Fuller’s consider to be the ‘best ingredients’ of the year. We were lucky enough this year to interview Fuller’s Director of Brewing John Keeling and that makes this year’s beer just that little bit more special for me. 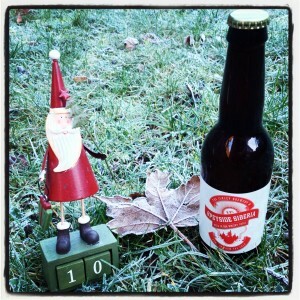 Today’s beer was a last minute substitution. Welcome to the pitch Siren Craft Brew’s ‘Odyssey 001’, an uber-blended Russian Imperial Stout. This is actually my second beer, but I explained all of that yesterday. Tonight’s selection was Ilkley Brewery’s ‘Worlds End’. It’s an 8% Islay Whisky barrel-aged version of their amazing chocolate and chipotle stout ‘The Mayan’. I was a little scared apprehensive of this beer as I have fond memories of The Mayan giving me a real burn from the chipotle and I thought this would be enraged amplified by the barrel ageing. 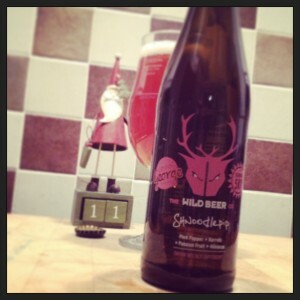 You may have noticed that I didn’t get round to drinking my #12beersofxmas entry yesterday. Life got in the way for a bit with a family emergency that saw me at the local hospital until well gone 10pm. By the time I was home I really didn’t think that I’d be doing the beer any justice at that time of the night so a reshuffle is on order. I’ve been excited about this moment for months now. 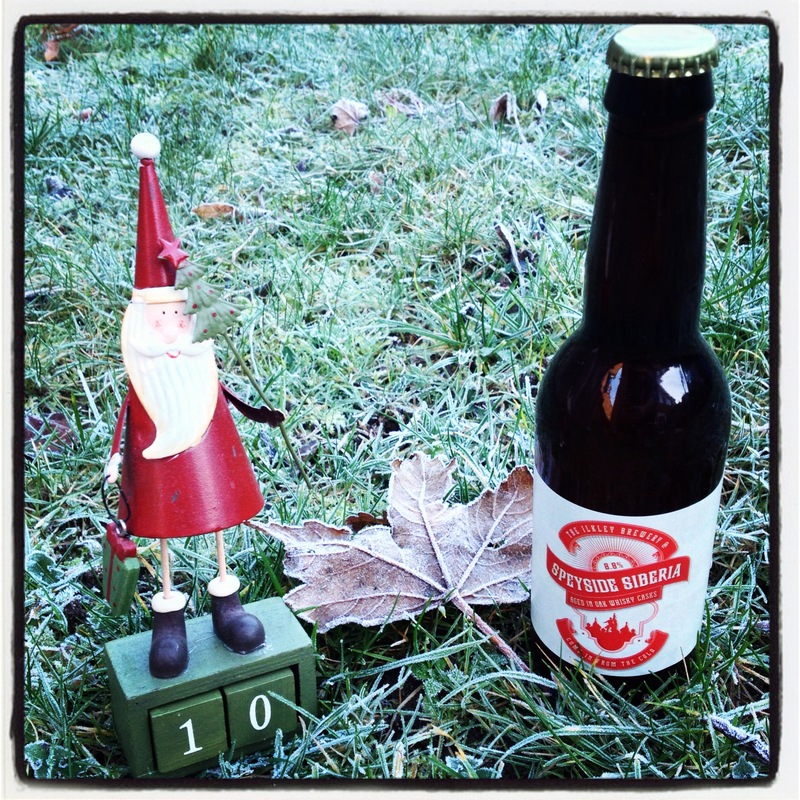 Cracking that first beer on the first day of the #12BeersofXmas. It’s a beer I’ve wanted to try for ages and one that I have Andy Parker to thank for who gave me this 1 litre bottle of 2011 Williams Bros Brewing Co ‘Nollaig’ last Christmas, and one which I successfully managed to stash cellar until this year. I’ve been excited about this one. Very excited. Lots of friends have drunk this and advised the best way to do it and how wonderful it’s going to be and I was just hoping it was going to live up to the high expectations. I’m now a dab hand at getting through a wax seal (having done it once during this run) and after I got through it and cracked the top I was instantly greeted with sweet piney, roasted aromas. I simply could not wait to get this into the glass. The pour is thick, black (even though it’s a brown stout) and leaves a lovely creamy brown head. There is a big boozy aroma from the glass and you get coffee laced with cream while at the same time almost getting a whiff of JD and coke. The taste is like nothing I have ever sampled before. It’s like a smooth espresso and the bourbon ageing is coming through in every gulp. But it’s not harsh, it’s smooth, it’s warming and it just makes you keep going in for more. Big piney aromas continue throughout the drink, there is a thick flavour and finish, but I just can’t get over how smooth it is. As I near the end of the glass the smoothness continues, but the roasted flavours begin too give way and there’s slight fruit tones in there. This is so well balanced and so well delivered – I am so pleased I left this one right until the very end of the run. As I finish New Year’s Eve and head into a 31 day dry spell, I’m happy to be going to bed in the embrace of a bearded lady. 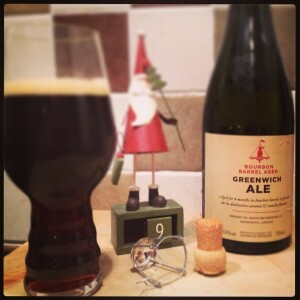 #12BeersOfXmas – leave a review of your beer for today below (or a link to your blog) and your Twitter name so we can give you a shout out. Merry Beermas! Once the cap is off, the aroma is nothing special, but the pour is stunning. In comparison to last night’s beer that was as flat as a pancake, this is bubbly, lively, fizzing and leaves a lovely pure white foamy head. The beer itself is a deep amber colour in the glass and has a much more appealing, lightly fruity flavour. Before I take the first sip, just a reminder about this beer – spelt, pink peppercorns, saison and brett yeasts, wood aged in French red wine barrels, passion fruit and finished with hibiscus flowers. Now do you understand why I may have been ‘concerned’? On the first sip I’m getting wonderfully sour, fruity notes. No bitterness so to speak of, but you get the passion fruit on the aftertaste. Then there’s a warming. Now this could be from the peppercorns but it’s a similar warming and feel that I get when I drink red wine, so I’m guessing this is from the barrel ageing. It’s very easy to drink and is most refreshing. You’d have to be careful if you were surriounded by this one as I imagine the 6.5% ABV would sneak up on you. The head is lasting well down the glass and I’m now getting an aroma similar to that of Haribo Tangfastics and a mouthfeel like I’ve been punched with a handful of them. I think I’m getting most of the flavours, although I have to confess that I have absolutely no idea what hibiscus tastes like. The finish is smooth and really coats this mouth and as I near the end of the glass I’m beginning to wonder why I was so concerned about this drink. In summary, a wonderfully unique collaboration that is perfectly balanced and marries and number of flavours with skill and precision. 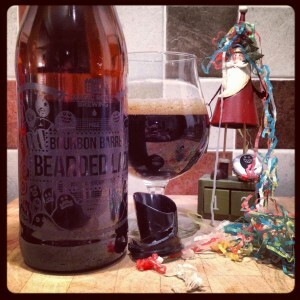 Tomorrow the #12BeersofXmas ends with the big one – Magic Rock’s BBBL. Day 10. I’m beginning to feel the effects a little now too. I don’t think I’ve ever drunk this many days in a row, and right now the Dryathlon is looking positively exciting. I have a constant headache, I’m always thirsty and I’m not getting full nights’ worth of sleep. I’m not just drinking the one beer a day as there are warm up beers and cool down beers plus there have been guests. Oh so many guests. But I’m nearly there and I’ll be damned if I’m giving up now. Today’s beer is one that I had the pleasure of enjoying the original version in the summer and this 700 limited edition bottle run really excited me. The same beer but aged in Speyside Whisky barrels, so it’s going to be awesome right? Wrong. On cracking the bottle I was instantly hit by the sugary, yeasty aromas that I’ve come to expect from a saison. The pour was thick and resulted in an orange beer in my glass but something was missing. Ah yes, carbonation. There was none of it. No fizz, no head, no nothing. In fact the finished product was more reminiscent of Beavertown’s ‘Uncle Joe’ kvass than anything else. On first taste I was hit by the big boozy flavours from the whisky, which continues to warm after the initial swig but there was just nothing else. Where were the rhubarb and custard sweets that I so enjoyed in the flavour of the original? Where was the fizz? Where was the crisp hit that I’ve come to except from a saison? There was just, well, nothing. A little sugary sweetness, a bit of a tart finish and then nothing. And all too quickly it was over. A very disappointing night on the #12BeersofXmas. Only two days to go now – NYE is the big one and before we get to that there is tomorrow. Yes, tomorrow. The Shnoodlepip. A beer that I think scares me a little. Only time will tell. Once the cork is popped (yes, cork) this pours avery deep red colour with an off-white creamy head and aromas of toffee, caramel and liquorice. Unfortunately, that where it all seemed to end. None of the flavours followed through, there a slight roasted maltiness going on in the background and a hint of a bitter finish but very little else. As it warmed in the glass a little, there were some woody aromas and a more roasted after taste, but still nothing exciting. Very disappointed in this – not a lot else to say really. My mate James liked this one though and said that it complimented the chilli and smokey cheeses that he was enjoying.